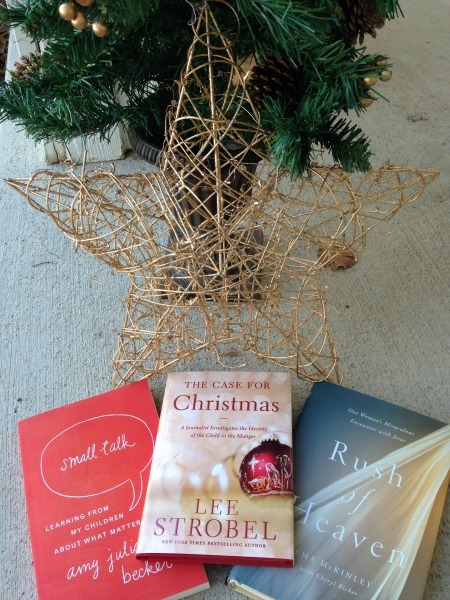 Today I’m not only sharing precious stories for kids this time of year, but I’m sharing a few books for adults that would be great to read yourself or give as a gift. Christian publisher Zondervan and their children’s division Zonderkidz are always a favorite! The Case for Christmas: A Journalist investigates the Identity of the Child in the Manager. A smaller sized 90-page book that would be make a great present topper. Invites readers to consider why Christmas matters in the first place. Somewhere beyond the traditions of the holiday lies the truth. Your customers will find this little book a timely product, perfect as a gift or for use in ministry during the Christmas season or any other time of the year. Rush of Heaven: One Woman’s Miraculous Encounter with Jesus. Love stories like this! Small Talk: Learning from my Children about what Matters Most. It’s important to set good examples of Faith to our kids. Almost every day, one of Amy Julia’s children says something or asks something that prompts her to think more carefully: “What ‘lasting’ mean?” William wonders when he hears a song about God being an everlasting God. “If the children who died went to heaven, then why are we sad?” Penny asks, when she passes by a funeral for a victim of the Sandy Hook shootings. “I don’t wanna’ get ‘tized!” says Marilee about baptism. 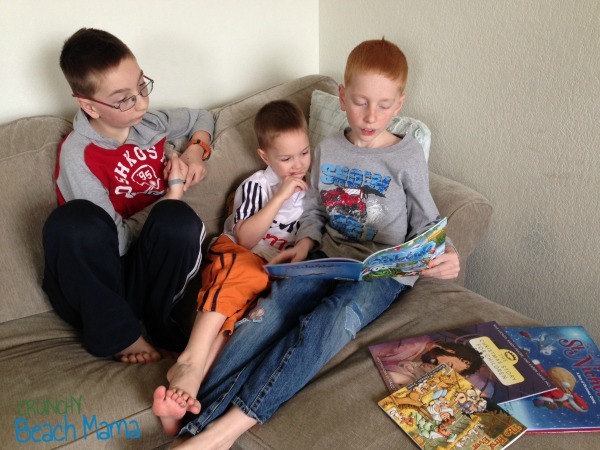 The other day I spied 3 little boys reading their new Christmas stories together from Zonderkidz…snap went my camera. Have to capture these moments! The First Christmas Ever (only $1.99!) Geared towards ages 4-8 this first Christmas story there wasn’t a Christmas tree or stockings by the fire. There was only a stable, some animals and shepherds, and a manager filled with hay. But on that special night when Jesus was born, the world changed forever. It’s that wonderful time of year again—the Yuletide Ice Cube Fair! It’s a time of festivity and fun as veggies gather to munch on snow cones, slurp down slushies, and ice skate on the frozen pond. But the greatest part of all is the Ice Cube Carving Contest! The Christmas Story for Children Love this kid-friendly, wonderfully illustrated story about our favorite night. Follow the events of Jesus’ birth as you read this lovely picture book written by Max Lucado with Randy Frazee and Karen Hill and illustrated by Fausto. The story tells readers about the birth of a special baby whose story is filled with love for us all. The Legend of St. Nicholas: A Story of Christmas Giving. Bright and beautifully illustrated by Richard Cowdrey from Marley and Me. One of my favs to read this year! The story of a young man named Nicholas, who was moved by the plight of the poor and needy. Nicholas spent his life secretly helping the poor all over the world, giving gifts on Christmas Eve to remind people of the greatest Gift of all, Jesus Christ. WIN all 4 of the Zonderkidz Books! I received these products for review and all opinions are my own. This giveaway will end on December 18, 2014 at midnight EST. Winners will be drawn via rafflecopter. Once a winner is drawn I will contact them and they will have 48 hours to reply before I draw a new winner. Giveaway is open to anyone in US and you must be 18 years of age or older. Giveaway not affiliated with Facebook & I release them of liability. Winner will be posted in the rafflecopter widget. No, I haven't, but I should find them this weekend and start reading them with my daughter! They stay out all year long here lol. My kids love their Christmas books! :) Thanks for the chance to win! 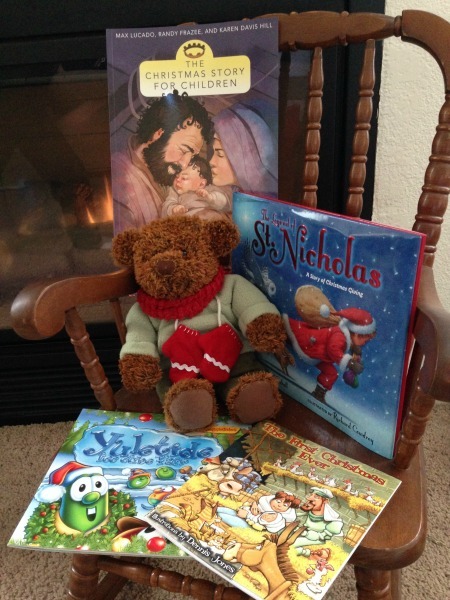 I have read our Christmas books to the grandkids. Yep--my son has been reading them every day. YES!!! We have enjoying our Christmas Books and Christmas movies so much. I love sitting down with my granddaughter and reading books to her. I, myself, love to read and I am hoping to pass that on to her. thank you! I haven't yet. I keep trying but my kids don't want to read them! :) Maybe having some new ones would spark their interest! Thanks! Yes, I have them out and we started to read them on Dec. 1st with a christmas book read everynight until Christmas night. A great family tradition. My family has already pulled out all our Christmas books and have been reading them together at night for the past week. We have started with the winter and snowmen books - Christmas books will begin in a week! I have not pulled them out yet! Soon though. We are heading to get the tree this weekend. My kids and I love Christmas books! Yes, they're out and have been read many times. Not yet, But we will the week of Christmas! Such a lovely time of year! We really don't have any Christmas books. I'm trying to start a collection for my grandson who loves books. We just pulled out a few of Christmas books last night! I have! We started reading them after Thanksgiving! Just pulled the first one out tonight to read to my daughter at bed time. We don't really have Christmas books yet. These would be great! We only have a couple of books and we haven't pulled them out just yet. My husband was reading part of the story from the gospel to the kids last weekend though. We've had the Christmas books pulled out since the day after Thanksgiving!! I have a lot, since I used to teach first grade and my 3 year old daughter LOVES them!! My children love the tradition of reading several Christmas stories on thanksgiving night. It's the first step in celebrating the holidays. Actually, I don't have any kids Christmas books, but I do have lots of back years of Christmas Country Living books. oh yea like always we keep them packed with the tree and stuff,lol. Yes, we are reading our Christmas books! Yeas, we pulled out our Christmas books. Our 2 granddaughters love to read and listen to the recordable books we do each year. Yes! We love reading our Christmas books. My Christmas books stay out all year in the book cabinet! My daughters love to be read to and love to look at the pictures. Yes, we are enjoying Christmas books from our little stash.